I mentioned in my last Birchbox unboxing that I was going to unsubscribe from them because they just weren't really impressing me anymore with their boxes and their new early access to samples structure irritated me. I was perfectly content with getting ipsy as my only makeup subscription service as I was trying to cut back anyway. Then, one day, I received an e-mail from Glossybox. I had subscribed to their e-mail list to be notified when they became available in the US, but once they became available I didn't subscribe. The title of this e-mail in my inbox was "The most important sale of your life". That was an awfully bold statement and I couldn't help but be intrigued to see what this sale could possibly be! Turns out it was a pretty nice deal that I couldn't pass up on. This e-mail gave a coupon code that gave the first 500 people to use it 30% of Glossybox every month. That brings this box down from $21 per month to just shy of $15 per month. After some quick research I decided this was a good deal and I signed myself up for the box figuring I would get my box in November. I was wrong! My October one shipped within the next few days. First of all, I couldn't get over the box this came in. I know that not all of them are like this but this is so cute! I have a serious issue of hoarding the boxes these subscription services come in because I swear I'll do something with them (even though I won't), but this I would have no qualms about using as a gift box! This is the Vive La France box, and according to the Glossybox Facebook page "is meant to give you the feeling of a Parisian getaway from the comfort of your own home with the help of fabulous French products". I've always wanted a Parisian getaway so thank you, Glossybox, for giving me one without having to endure a long flight over a crazy big body of water. That's not terrifying at all. I absolutely loved opening up my box and seeing this. It just looks so luxe. Not to keep picking on Birchbox, but it just kind of felt like everything was thrown together with that box. All the products were loose in the box and everything was just loosely wrapped in the tissue paper. I can see that this is put together a little more carefully, which I suppose is what you get when you're paying that extra $11 per month. The adorable artwork continues on the fold-out card that describes all of the products found in your box. I love how much detail you get with each product and the tips and tidbits are helpful and interesting. I really feel like I get a good understanding of each product and how to use it before even diving into the rest of the box! Again, A++ for packaging. I love that they have the products securely in there with the packing paper. Four of the five products that are in this box are in glass packaging so instead of having them banging against each other and potentially being damaged, I know they'll all sit snug in their spot and I don't have to worry. Let's dive into the products! LOLLIPOPS MAKE UP PARIS NAIL LACQUER IN "VOYAGE À PARIS"
this red hue will become a staple part of your beauty routine. to their original size, causing chips and cracks. guaranteed to be the center of attention! sensitive skin, your complexion will be radiant and ready to face the fall. that repair acne scars and burns. preventing future damage. Say goodbye to fried, brittle locks! Universalis evokes the ideals of the modern Marie Antoinette. color variations is normal and does not alter its quality in any way! That is everything from my October Glossybox! I'm really excited because I don't think that I've ever used anything from any of these brands. The only one I think I might have used before is Nuxe but I can't be certain. I've tried the perfume already and I really like it! I haven't been much of a perfume person but over the past couple months I've been working my way through all of the samples I have and have been enjoying them, so I'm excited to add this to the rotation. It's really light and not offensive so I will be getting quite a bit of use from this. Plus, how cute is the tiny little perfume bottle? So much better than those tubes you usually get. Also, I would like to point out that the lipgloss, nail polish and exfoliating gel are all full size products. Just the Nuxe product alone puts this box over the $21 you pay! I'm really excited to continue getting this box and it could very well stand alone by the end of the year as my sole makeup subscription box. My November box is already on its way so I can't wait to see what else I have in store! 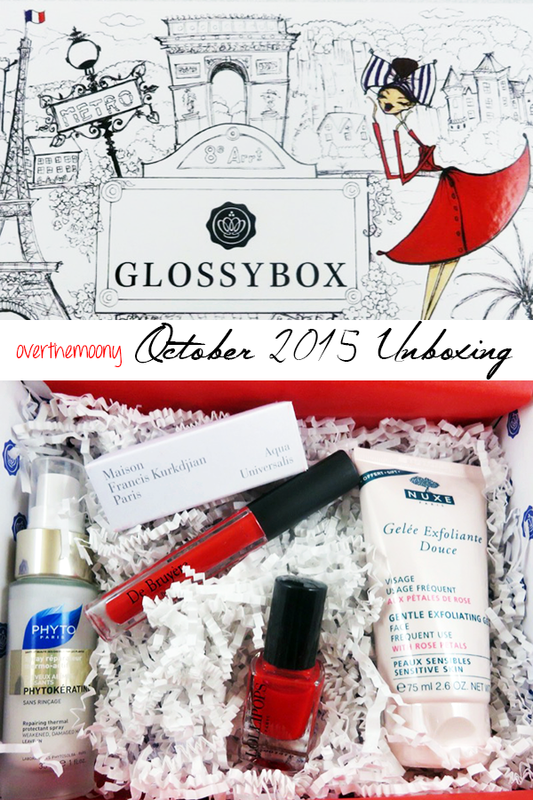 Are you subscribed to Glossybox or have you been wanting to subscribe? Are you in love with a different makeup subscription box? Let me know in the comments!